You’ve heard the old adage “failing to plan is planning to fail”, right? Gosh, feels like the story of my life. I’ve been in this rut lately of going to the gym in the middle of the day, about the time normal people with well-planned, put-together lives would be eating lunch. I run a few miles, fueled only on coffee and maybe a cookie or 2, and then return home, a ravenous beast. Watch out, I’m going elbow deep in the granola, almonds are consumed by the handful, and my daily cookie count triples. Hey, wait! I just did something good for my body. Why am I un-doing it as soon as I get home? Because I fail to plan. Regularly. No more! If I plan just a teeny-tiny bit, I can make a killer salad in 5 minutes, stuff my face with that and go about the rest of my day feeling proud instead of remorseful. 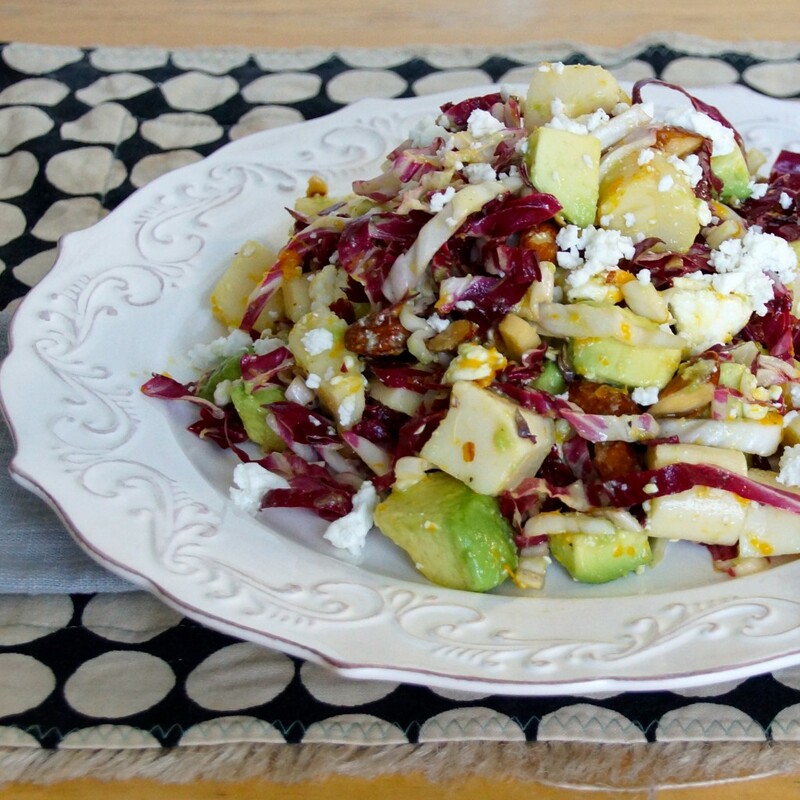 Today’s salad is a colorful jumble of radicchio strands, creamy avocado, crunchy almonds, hearts of palm, and feta cheese. 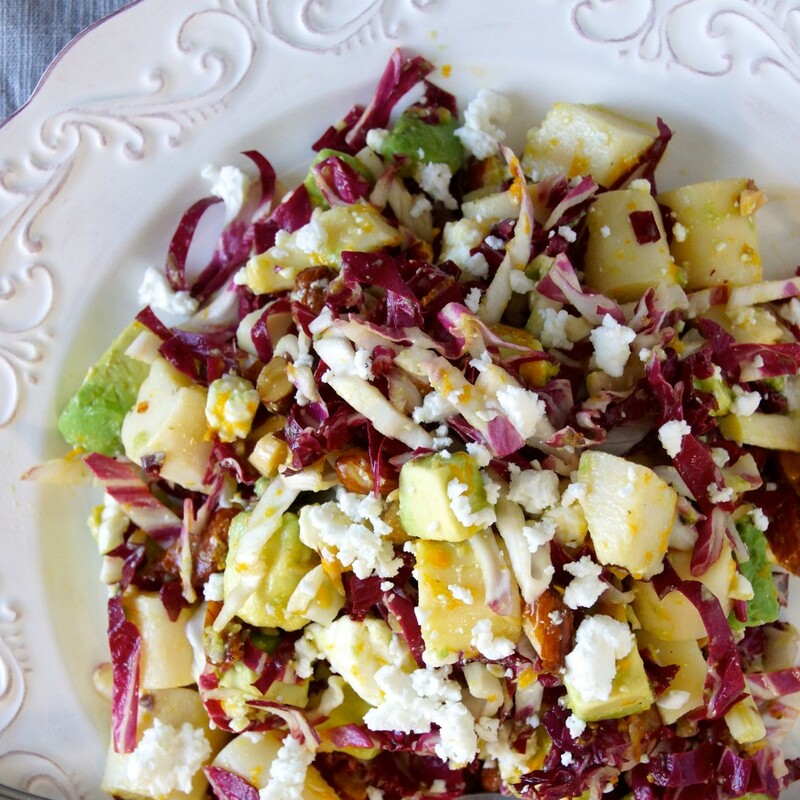 Who says salads are boring? We’ve got color and crunch. Bright citrus. Creamy, salty, bitter, briny: our bases are covered. 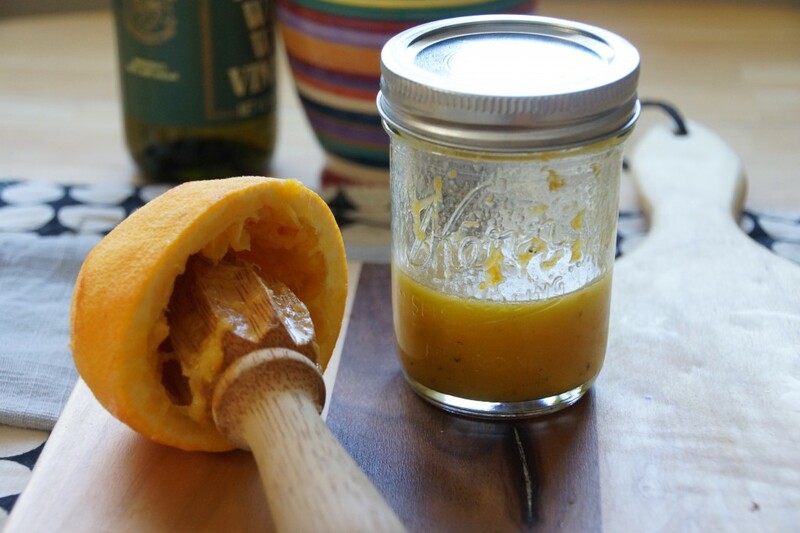 Shake up an orange vinaigrette. Zest, juice, olive oil, salt, and pepper. Splash in a little white wine vinegar if your orange is as sweet as mine. Drain, rinse. Chop. Crumble. Gently toss and lightly dress. No more failing to plan or planning to fail for this girl. Planning to succeed and succeeding with a plan tastes way too good. And cookies are better enjoyed when you’re not filled with regret. 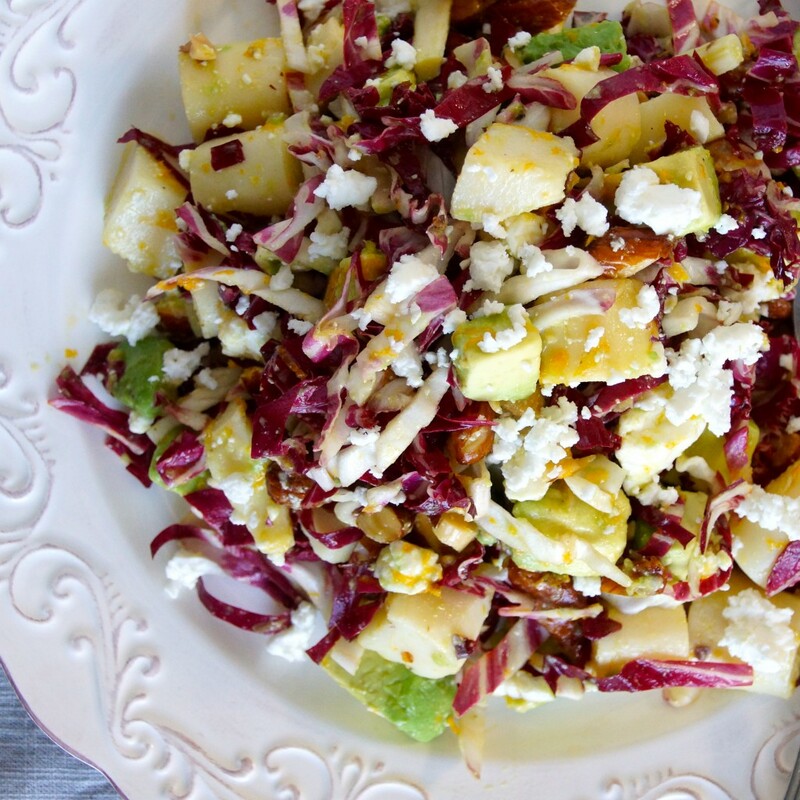 If you'd like to make this salad heartier, add a cup or 2 of cooked quinoa. 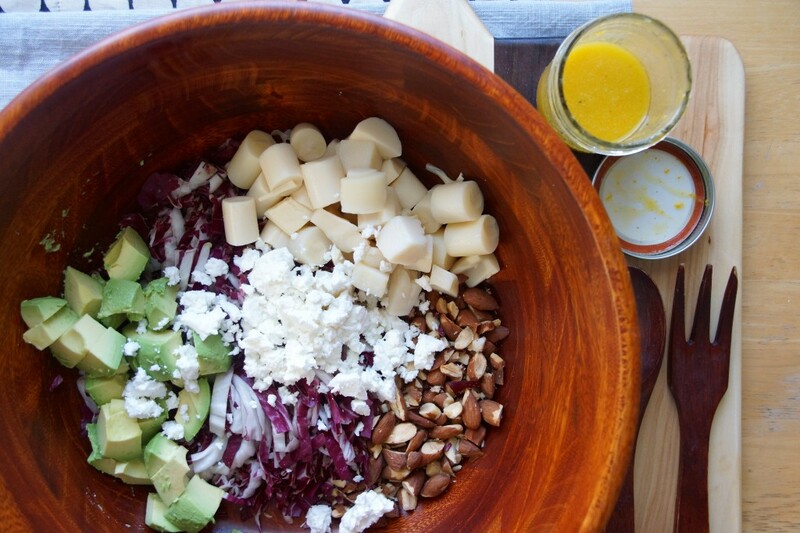 Combine radicchio, hearts of palm, avocado, almonds, and feta in a large bowl. Combine remaining ingredients in a small lidded jar almond with a pinch of salt (not too much- the feta will contribute a fair amount of salt) and a few grinds of black pepper. Shake until well combined. Toss salad with dressing. Season with additional salt and pepper, if needed. This looks really, really good! 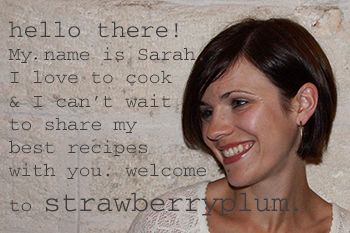 I hear you about the cookie guilt – this is the perfect antidote! I will be making it this week! 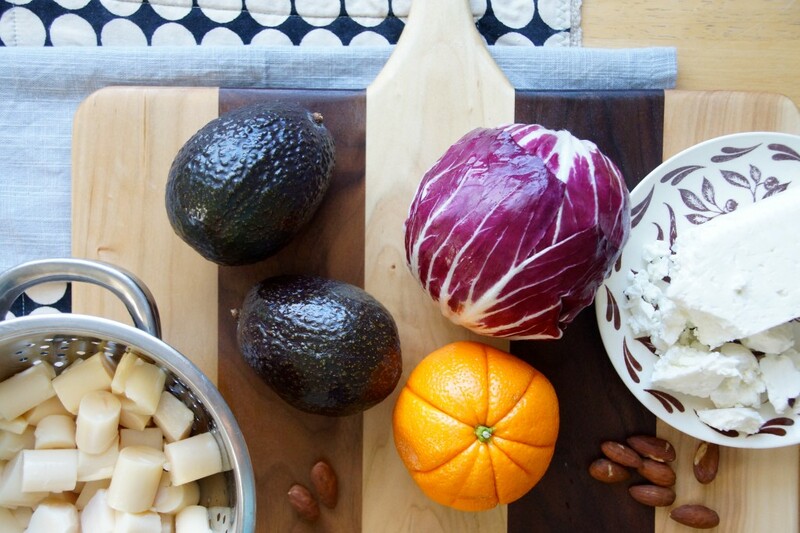 It’s a simple but really satisfying salad. Hope you like it!